Toys and other gifts have been passed on to a respite centre for children with serious conditions in memory of a much-missed son who died in a tragic accident. Shane Sloan, 18, from Penshaw, had only just passed his driving test when the Citroen Saxo he was travelling in hit a lamppost in Mount Pleasant, Washington, in 2011. Shane Sloan's family with youngsters who use facilities at Grace House. The former Biddick Community Sports College pupil suffered serious head injuries and died after a five-day battle for life. Shane, known to friends as Shorty, was training to be a mechanic at college, but had a promising skate-boarding career ahead of him and was waiting for a sponsor to go professional. Following his tragic death, his loving mum Caron Heatherington organised fund-raisers in her son’s memory, taking the form of street sport competitions. The group have also taken part in the annual Boxing Day Dip event at Sunderland seafront. However, the events such as the street sport competitions have become more expensive to run and difficult to put together in recent years. Caron, along with her husband, Shane’s stepdad Dave, and her daughter Sam, Shane’s sister, decided instead to buy £500 worth of toys with the remaining fund-raised cash to give to Grace House in Southwick. Caron, 55, said: “We did the street sport competitions for a few years and it always went well. People told us how great it was. “But a lot of Shane’s friends are grown up now and have kids of their own so it’s harder to organise. 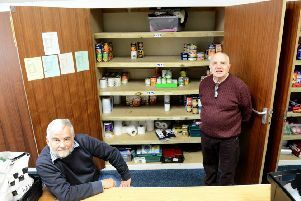 “We saw that Grace House were in need of toys and with £500 left in the fund we just thought it would be a good idea to use the money for that. Caron added that she and the rest of the Shane’s family have been heartened by the gratitude of Grace House staff and those who use the site. “They were absolutely over the moon with what we’ve done,” she said. “I’ve been sent a thank you card and letters from them, which is lovely.